Optokey’s products offer complete sample characterization solutions and yield situationally sensitive spectrum data and detailed insight into the elemental and molecular composition of the sample. These systems and proprietary software can be precisely tailored to customer’s requirements to sense a wide range of analytes, including organics, heavy metals, and biomolecules (DNA, peptides, lipids, etc.) and other materials. The instruments offer simple user interface and operate under computer control for fast and accurate results with no adjustment or alignment steps to introduce error. The system produces complete results in seconds rather than in minutes or even hours. 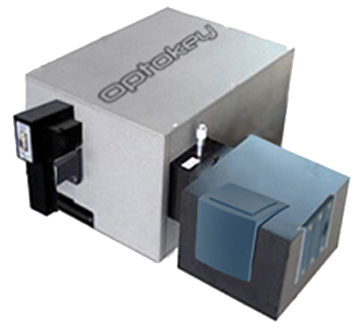 The Optokey proprietary reagents yield improved accuracy, repeatability, and reproducibility. Tens or even hundreds of tests or individual molecules can be analyzed in a single sample pass with specially configured multiplexed sample holders. The Optokey technology offers proven breakthrough performance expertly engineered into one fast, low-cost test system. The Company’s breakthrough technology is ideally suited for many global analytical applications. The new technology will become the preferred method for many high-volume, high-resolution analyses for chemical and biochemical applications as well as becoming an important clinical tool. In many applications the technology will replace and upgrade standard LC-MS/MS (or HPLC-MS/MS) and other older methods as the analytical chemistry technique of choice for routine specific detection and identification of dangerous or illegal compounds present in everyday products. The Optokey system is extremely versatile, and can be tailored to sense organics, heavy metals, and biomolecules (DNA, peptides, lipids, etc.) according to market opportunities. Tens or even hundreds of tests can be analyzed in a single sample pass with specially configured multiplexed micro-fluidic slides. The technical staff at Optokey has assembled a deep scientific knowledge base while developing this new analytical tool and related proprietary reagents. The staff has demonstrated significant enhancements in high sensitivity as well as improved cost effectiveness compared to those methods commercially available today. The specialized reagents developed by this team can be readily tailored to specific applications based on customer and market demands. Typical applications include general food safety monitoring, clean-tech, environmental monitoring, micro-volume analysis, biological and chemical process controls, pharmaceuticals, medical diagnosis, and homeland security. Optokey has developed unique capabilities in the design of opto-mechanical and electro-optical systems. The Company’s engineering and design staff has successfully demonstrated this unique capability in optics and photometric system challenges spanning standard and specialized applications. The technical staff has years of hands-on experience in state of the art optics, laser technology, and manufacture of high precision optical components, and is equipped with a suite of software packages making custom optics development quick and cost-effective. Additionally the team benefits from the on-going support and expertise of Lawrence Berkeley National Labs.